Puppy Dog Pals will continue. According to The Hollywood Reporter, Disney Junior has renewed the TV show for a second season. From comedian Harland Williams, the animated series ” follows two fun-loving pug brothers, Bingo and Rolly, whose thrill-seeking appetites take them on exhilarating adventures throughout their neighborhood and around the globe.” The voice cast includes Williams, Issac Ryan Brown, Tom Kenny, Sam Lavagnino, and Jessica DiCicco. Disney Junior has not yet announced a premiere date for season two of Puppy Dog Pals. What do you think? Have you seen Puppy Dog Pals? Are you glad it’s been renewed? Yes!!!! My 15 mo old ONLY watches this show!!! No matter what’s on tv he will be upset until we put this in! Thanks for on demand & dvr! The show is super cute, educational and funny!! 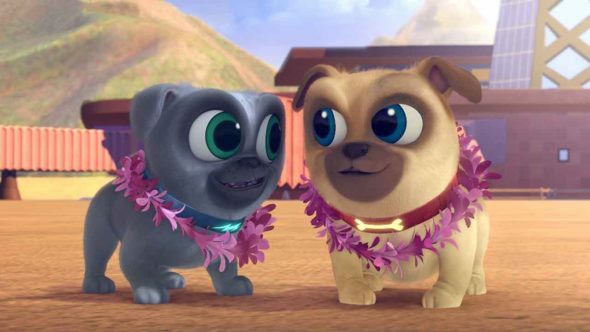 Glad that Puppy Dog Pals have been renewed. My grandson and I really enjoy watching them together. He has a stuffed Rolly he sleeps with at night. So HAPPY THEY KEEPING PUPPY DOG PAL I WATCH WITH MY SONS TBEYOVE.IT I AS ADULT EVEN LOVE IT.ITS VERY GREAT SHOW FOR KIDS RELEASE NEW SEASON KEEP MAKING THEM NEVER STOP MY BOYS BE HEART BROKEN IF NO MORE NEW ONES. I WILL GO NEWS AO PLEASE KEEP PUPPY DOG PAL THANK YOU! We all love puppy dog pals! My son likes it more than Mickey mouse now. Puppy dog pals is my daughters favorite show and the only show she really gets into. She dances when she hears the intro song….. I don’t know what we would do if they weren’t bringing it back. Pupp you dog pals is my sons favorite show. Sometimes this is the only show he will watch. We are very excited to hear there WILL be a season two. Love this show, please bring it back soon! Waiting for new episodes. My 8 and 5 year olds enjoy it and so do I. This is the first show my child has liked! I will be so glad to see a second season of puppy dog pals,it can’t come soon enough,I have seen them a million times,I really like the show & keep lookung for new season 2 ,all my grandkids are CRAZY about it, my 2yr old granddaughter watches it all day long every day ,so please come out with it ASAP LOL. Thank you . My son loves this show.. and it’s way better than Thomas! But I need new episodes!! Please bring back new episodes of PDP as soon as possible! This is the only show my 18 month old watches so the re-runs/DVR are on in our house 24 hours a day. My whole family loves the show and we can’t wait for more new episodes! !